Photo provided by Esteban Cervantes Jimenez. 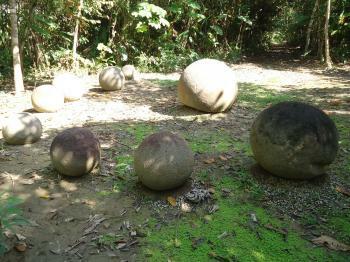 The Precolumbian chiefdom settlements with stone spheres of the Diquís are four archaeological sites containing mysterious stone balls. The settlements date from the Chiriqui Period (800-1500 CE), during which a hierarchical society developed in southern Costa Rica. The area contains artificial mounds, paved areas and burial sites. Stone spheres or petrospheres are spherical man-made objects composed of stone. These are rare in their perfection and large size (up to 2.57m diameter). They were sculpted from a material called gabbro. The meaning and use of the stone spheres remain largely unknown. This is a serial nomination of 4 archaeological sites: Finca 6, Batambal, El Silencio and Grijalba-2. Site just visited (November 2017). Initially I tried to visit some more places but all in all I managed to see only Finca 6. Currently due to high level of rainfall the site is oficially closed for visiting but after some negotiations with site guards I was able to see the site (althouh the exhibition part / museum was closed). Finca 6 is easily accessible by bus from Palmar Norte town (take a bus heading to Sierpe and take off near the museum, its some 9 km from Palmar), come back the same way back. The bus circulates every 45 minutes during the day. Entrance to the archeological site is around 300 m from the bus stop. As everything was perfectly described by Esteban (great job done) I will focus on trying to find other sites. So after visiting Finca 6 I intend to see the closest place - Grijalba 2. I take off the bus near the airport and staretd to explore the area. After some hours of exploring places north of airport, questioning several local people I found nothing. Believe me - I spend some hours and local people can confirm that - it is not the place. Later on I realised that the coordinates of this particular place were completely wrong. The real place is located on the opposite side of the river, close to Osa municipalidad. Other place seem to be correctly identified - El Silencio - the biggest sphere found in the area and Batambal. Mind that there are no signs of the places so you should rely on GPS coordinates when trying to find them. As part of the tour, me, my partner and a group of other 20 Costa Ricans and some resident Argentineans, traveled some 300 km to the cultural festival known as La Fiesta de los Diablitos (or the Party of the Little Devils), a tradition from the Boruca indian community which exists since colonial times, and takes place on the first weekend of January in Boruca Territory, and the first weekend of February in Rey Curré Territory, where we went. I thought it was the most interesting part of our journey, and is totally deserving of being in the Intangible Heritage List, in case it is ever nominated. I bought a mask, there is plenty of handicrafts at reasonable prices, made by the borucas themselves, who, after losing most of their own culture, are in the process of recovering it. The museum in site is in the shape of a U-suré, a traditional house representing their cosmology, and has a much better museology than I could imagine. Everything was a magical experience, the contact with another cultural tradition. We were going to also visit the Terraba or Terbi culture, in the middle of the Térraba River Basin, but were unable to do so, because of the time. We spent Saturday night in San Vito, the seat of Coto Brus canton, that has an interest on itself, because it was first established by italian colonists in 1950, the pizza we tried in one of the local businesses was great. Next morning we visited the Ngöbe buglé (formerly guaymí) community indigenous territory of La Casona. The Ngöbes keep their traditions much better than the borucas and terrabas (the women are attired in a distinct manner, for example) and we visited the projects they have to protect their roots, tried some of the local produce and we visited a pristine river. After that, we went back to Paso Real (near there is one of the entrances to La Amistad International Park and WHS) and had lunch in Palmar Norte, in a nice restaurant. Then we crossed the old Térraba River bridge and in Palmar Sur, one sees a lot of the buildings from the banana enclave from the 1930s. The architecture there (which is considered excellent against the excess heat and rain that happen in those wet lowlands), the presence of an old rail station and a restored train, transports one to bygone times. Finca 6 is in the road to Sierpe district. The road is surrounded by palm oil trees, fully ordered in fincas (plantations) and the finca's towns, that come from the banana days. On one corner of the road, one sees some spheres that were dynamited in the absurd pursue of richness, when in the 1930s it was rumored that the stones contained treasures, or because of the construction of the road . It is a graphic showing of the attitude that Costa Ricans had (and some people have yet) towards heritage and its assets. Partly a source of richness through pillaging, partly an obstacle to 'development'. Apparently, that attitude is changing. Then, next to a turn of the asphalt road, there is a sign indicating the entrance to Finca 6. Inside, the car has to cross the bridge of an old channel and one arrives to a small parking lot. The WH sign is there, and next to it, a very appropriate visitor center and museum. It interprets, in a modern key, the tropical victorian architecture from the enclave, with its elevated podium for protection, high pitch roofs for ventilation, corridor, and use of wood. I have to say that my experience of the museum, was a little bit under my expectations, not because of the museum displays themselves or the information given (this is a really good work of museography, even when there is for me too much text, it is in both english and spanish, there are a lot of images, maps, dioramas, sculptures, and even a stone sphere), but because of the lack of time that we had to see it all. It should demand more or less an hour to fully digest it. In general, it explains the elements that made the Gran Diquís cultures different from other cultures (more related to the Colombian Chibchas, than to other Mesoamerican cultures), and make such works of admirable craftsmanship as the spheres. It explains the natural aspects of the area, like the river delta with its plenty of resources, and the mountains of the Brunqueña sierra as a source of protection and the source of the raw material for the spheres. Both of them are located kilometers apart, posing questions on the way the spheres were transported to their final locations. As much is unknown from the real motivations and meaning that the stone alignments had, it is explained as a possibility that the stone sites relate as a symbol of power for the cacical societies, with a both political, religious and astronomical relation. I was glad to see that pseudo-scientific arguments (UFOs and that kind of things) are openly discarded in the museum display. Then one leaves the visitor center through a ramp, and one walks throughout the site, which is fully signposted. The distances are short and the terrain is very plain, but in my case, the heat from the middle of the dry season at less than 50 meters of altitude, with a high humidity, was excruciating. Light clothing, plenty of water, comfortable shoes and a hat or cap, are fully recommended. One clarification is necessary, before stating it as an underwhelming site. 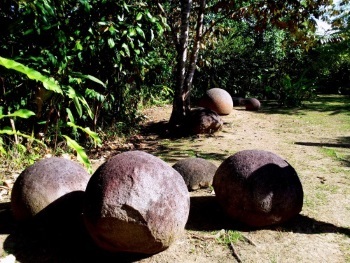 Finca 6 is the site with the biggest agglomeration of stone spheres in their original alignments, but almost everything was discovered, then studied, and then covered back again to allow the ground to protect the spheres and other remains. So, what one sees in situ is just a small part of what is in museums or underground. There is one place where spheres, stone columns and other elements are in an accumulation, but they are objects that were recovered from other parts of the country (such as private houses, or institutions) and are in the process of being assigned somewhere else, hopefully in their initial position. But still, that place gives a good idea of what the site consists of. An then, one visits the original arrangements, always surrounded by plenty of vegetation and remains from the plantation times, like air conveyor belts. There is one clear in the forest and one sees the specific site where there are some spheres that, because of their location, have been interpreted as a reference for the constellation of Capricorn, cementing the possibility of the spheres as related to the agricultural cycles. However, it has not been found anything else to confirm this assertion. Then, one goes to a place where was located the center of power for the community, in the form of earthworks, and some spheres, where are visible. However, as I said before, for the pictures in the visitor's center, what is underground includes plazas, roads and burial grounds. 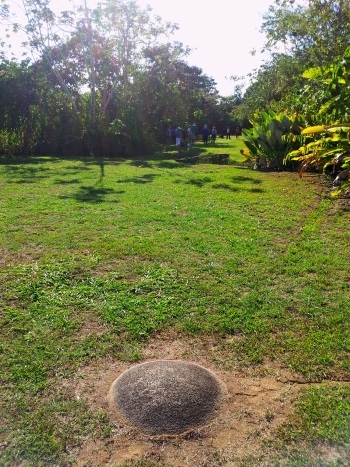 The last element which we visited was a place where burials are located, and some remains from the economical activities in pre-Columbian times, were disposed. Then we headed back to the parking lot, and left the site, but not before having a remembrance that -contrary what was thought in other times- the indigenous element is a part of our roots, as much as the other cultures that came to the American continent, like the Europeans, and the African or East Asian cultures that came later. Finally, I think that this site was extremely instructive as an experience. Of course, unlike many other archaeological sites, one sees just a bit of has been found. I would like to visit the other three components of the WH site: Batambal, Grijalba II and El Silencio, to get a bigger picture of this culture. Most of them are closed to the public, but I recently saw in Facebook the information of another tour and it includes Batambal, the one site that lies on the hills and overlooks the big river delta. However, what I saw, both on the site and in the museum, was very well presented, and therefore conveys a lot of understanding of what the importance of this site is. Erich von Däniken: theory of alien origin for the spheres in "Chariots of the gods"
Foreigner prices: Finca 6 archaeological site: Residents: ₡1.000; Non-residents: $6 (₡3.383 at today's exchange rate).